Reading Wendy Barker always makes me think about her beauty. There is the beauty of her person, of course. Her face, her smile, her shining eyes, her grace, her radiance that seem never to change. Anyone who has the happiness to meet Wendy will experience, as I have, as her students and friends have, a certain magic that’s like the magic of all fresh living things. You feel it fountain from within, and it washes you. Then there is the beauty of her mind. Barker’s writing, I feel, has a major source in her own love of beauty, in the world of nature, weather, the human body, children and other people, home and other places, painting, colors, music, memory, the cycles of birth and death, happiness and suffering—and words. Barker’s feeling for the charm of words is amply represented in this collection. Although she says that words “won’t do,” that “there is never a way to describe the things that rise/ before you,” or that “the shape of the word” you need may be “out of reach,” she also knows that sometimes the words do fall right into your hand. At times she lets us enjoy the sound of cosmetics—“Ivory Beige. Tawny Glow. Porcelain Rose”—even while letting us know she knows a mask is not reality. In “Light Pink Octagon,” she gives us a marvelous list of pink things that the Richard Tuttle artwork isn’t, “No carnations, no half-sliced roast/ beside the wineglass, no ruddy/cheek of a maid shouldering wheat,/ no dimpled buttocks of Venus or Bathsheba …” before shifting to describe the canvas as a “mainsail/ heading out to the wide ocean/ with the wind.” The mouth takes pleasure in the play of the syllables and in the spaces and absences they create. The physical world enchants Barker, and she makes it enchant us. Our knowledge of what is fleeting, what is unavailable and unavailing, enhances the power of the sensual, and vice versa. So, at the age of fifty, Barker feels “the ache to connect” more strongly than at twenty. In “At the End of August,” a symbolic moment, the sounds of rain, the flight of nestlings, the lapping of a stray cat as a domestic couple unpacks luggage from a journey, evoke distances in space and time. Approaching seventy, she gives us a catalogue of wonderfully-named trees—white pines, palo verdes, olives, eucalyptus, Mexican persimmon—associated with the loves of her life, along with those she’ll never see again, including “the Bodhi tree—under which the Buddha sat/so still.” Mortality is never far from consciousness in Barker’s writing, but mention of the Buddha reminds me that this is a poetry of illumination. And never more so than in the one piece reprinted here from Barker’s masterpiece of a prose-poem novella, Nothing Between Us. The scene is a remedial reading class, a place of frustration, and, in a beautiful and surprising turn, a place of enlightenment. Wendy Barker is the author of nine books and chapbooks of poems, a translation of Rabindranath Tagore, and a study of Dickinson. She is still hitting her stride, still wrapping her arms around the world. 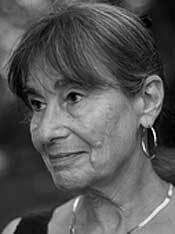 Alicia Ostriker has published fourteen volumes of poetry, most recently No Heaven (2005); The Book of Seventy (2009); and The Book of Life: Selected Jewish Poems 1979-2011 (2012). She has been a National Book Award finalist twice, and has received the William Carlos Williams Prize, the San Francisco Poetry Center Award, the Paterson Poetry Prize, and a National Jewish Book Council Award, among others. She teaches in the Drew University low-residency Poetry MFA program. What a stunningly wonderful and insightful review of Wendy’s work and her persona! Took my breath away…. When I think of Wendy Barker, I think of the word “radiance,” applicable both to Wendy’s person and her verse. Ms. Ostriker’s introduction is spot-on in capturing not only the “radiant” essence of this remarkable poet but also the breadth and inclusiveness of her embrace.